Ahhh!!!! The goodness of eating this glorious sweet candy/snacks once again all the way from my hometown GenSan. It was when a BFF of mine went home and I asked her a huge favor to bring a lightweight items for me. When in her kindness responds a YES, I contacted my sister Chem to buy me some Durian Candies and hoping they are available in my hometown. I have this specific brand of Durian candies that I'd love to munch. I was doubtful, as my parents from Davao just recently went back to Davao after spending some time in Gensan. 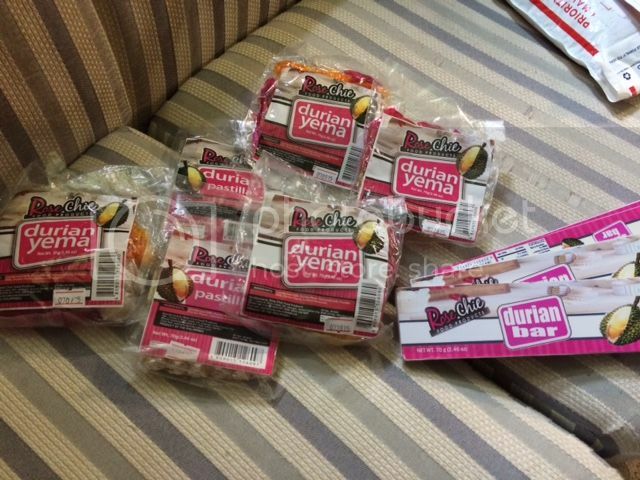 After asking a huge favor for my sister, she message me one night that she found a Durian sweet candy, however, it's not the brand that I've been looking for. I told her it's fine, it's better than nothing. Less expectation about what would be the taste like with this brand. But all I can think is when my Bff comes home from her quick vacation in the Philippines. Anyways, after weeks of waiting they arrive in the mail and I was very happy that I ate one pack in just 10 minutes. I know, I shouldn't be, but I just miss this sweet durian candies and just want to enjoy them while it last.